Status: It's been a long time since I've edited my status. I'll still be inactive, but might be on every week or so. 45px This user is a loyal fan of Nintendo games and hates Sony and Microsoft games. This user loves the Wii Virtual Console. WarioWare This user hates the WarioWare series............A LOT! 40px This user supports the Bureaucrats of the Super Mario Wiki even though he is jealous of them. File:DS logo small.gif This user owns a Nintendo DS. File:Wii small.jpg This user owns a Nintendo Wii. 63px This user's favorite Mario Kart track is DK Mountain. 45px This user enjoys reading the Nintendo Comics System. This user briefly owned a NES, but it stopped working. File:Wii small.jpg This user is looking forward to playing Mario Kart Wii, Super Mario Stadium Baseball and Super Smash Bros. Brawl. Wiki The first page this user created was Race to the Finish! This user loves ALL classic Mario games, namely SMB, SMB2, SMRPG, SMW, and DKC. Mii This user named himself Glitchman a few days after discovering the Minus World glitch. fan-3 This user thinks that Super Mario Kart, Super Smash Bros., Super Mario RPG and Donkey Kong 64 should be released on the virtual console. This user thinks Shadow Mario should be an alternate costume for Mario in Brawl. This user is friends with Stooben Rooben! This user is a friend of the user IS. Write articles for all levels in Super Mario World. Help fix up the Super Mario Bros. page and it's worlds. Add more info to the worlds of Super Mario 64. Help to fix up bad grammar throughout the Wiki. Mario in Super Mario RPG: Legend of the Seven Stars. 4 Quotes about me, mostly negative positive. Those who have come to this userpage before probably already know that I have been urging for a sequel for Super Mario RPG: Legend of the Seven Stars. Those who have helped the cause by writing to Nintendo are beginning to realiaze what an impact their work has made. Super Mario RPG DS is a remake (similar to Super Mario 64 DS) that's being rumored for release. Looks like our work is paying off! Unfortunately, it's only a rumor, but more information can be found here. The plans certainly are exciting, a port/sequel to this game on the recent DS system would introduce a lot of players who regret holding out on buying the game because of the Nintendo 64 to the game. I'll post whatever information I can get my hands on about the rumored game here on this userpage, but to all readers DO NOT expect more info anytime soon, on any site. In other news, Square-Enix, who helped develop SMRPG, will be involved in developing SSBB. Which means rumors have been appearing that Geno may be confirmed as a playable character for Brawl in the near future! I cannot give any direct sources, but I hope he will be announced as playable. I would guess that one of his special moves would be the warp-star (like the power-up) because of his true star-form. If I find any more information on the subject, I'll post it here on this userpage, so if you're interested keep checking! Bad news, for all wiki users. The inevitable has indeed happened, and SMRPG's virtual console release has been pushed up. All month it has been advertised to be released in 2007, yet only the same day it was supposed to be released did I see rumors of a 2009 release. I, for one, am very disappointed. And confused, because I had heard that when Nintendo announced this game to be released, it had great reception from fans. It is very strange, today was it's supposed released date, but in one day alone all information on the subject seems to have vanished. To all others who were eagerly anticipating this game's release as I was, you have my compassion:(. As odd as this may sound, don't expect any more news for at least six months, except for rumors of course. However, as of February 1st I actually do have some news concerning SMRPG. Apparently, Square Enix is under the impression that they could make a lot more money by making a DS remake, so that's why SMRPG has not, and possibly will not ever, be released on the virtual console. I personally would prefer it to come out on the VC instead of as a DS remake loaded with new bosses, cuz I want to play the ORIGINAL. Still though, absolutely nothing has been confirmed, but I'll see if I can't find any new information on the subject. Keep checking back for more news! THIS JUST IN: Here's the MOST IMPORTANT news regarding Super Mario RPG's virtual console release EVER! According to this source, SMRPG will be released on the VC in Japan in June of this year! I'm posting this news on May 31st, quite some time after the previous news four months ago. And while I, and all other American, European, Canadian, Australian, Mexican, African, Asian, and Portugese users are probably insanely jealous like I am, but there is hope for an international release! Check the source I mentioned for more info concerning release dates. Credit to IS for this interesting animation. On September 1, 2008, Super Mario RPG was finally released on the Virtual Console in the US, for 900 Wii points. Months of continuously fighting for its re-release have finally paid off! You might have already guessed this by my name, but I love to try out, and find new, glitches!! I've tried some glitches in SMS, as well as the more famous glitch, Minus World. And while I haven't actually found many glitches that have yet to be discovered, those I have are posted here, in order of when I discovered them. Oh, and by the way, since as of my knowledge none of these have been discovered yet, the names I listed for them are unofficial. I actually happened to stumble upon this minor, yet interesting, glitch in Super Mario World. Whether or not it has been discovered I'm not sure, but I've done some research and haven't found it. I found it on the Virtual Console version of the game, so it also should undoubtedly work in the original. I'm not sure whether or not it would work in the SMA remake, though. OK, to the point. I found this minor glitch in Vanilla Dome 2 in the virtual console remake of Super Mario World. I proceeded as one normally would (as Mario), by taking the vine up and swimming underwater. Then I collected the mushroom, not a feather or flower, directly after the 6x11 cluster of brown blocks, then went up. Once there, I naturally noticed the blue-shelled buzzy beetle on my left side coming toward me. I kicked it down, then picked it up, moved to ground on the right, jumped up, and threw it to my left. Instead of rolling on the incline as I had anticipated, it went THROUGH that incline and started bouncing around within the hill. It didn't go all the way to the left, just about an inch or two on the TV screen. Why this happened, I don't know, and I've tried to repeat the glitch since and have failed each time. Recently though I have discovered an OFFICIAL way to try the glitch. Interestingly, you can practice this glitch in other areas of Vanilla Dome 2 as well. I've successfully re-created this glitch at the beginning of the level, but not where I first discovered it. On the first incline you come across in the level (right next to the flopping fish), stomp on the buzzy beetle. Next, pick up and hold the shell, and then stand still on the incline while facing left. You should begin to slowly fall to the left. Let yourself fall for about half a second or so, then let go of the shell. If done correctly, it will fall through the hill and then bounce to the left. Pretty easy, eh? Sure, it's not a huge glitch, but it's quite interesting and I'm quite proud that I actually managed to discover a glitch >:D Hence, my name. I'll post another pic of the glitch at the beginning of the level instead of the middle SOON. For now, why don't you just take a look at my long and dull list of Mario games that I've played. Throught the Block Glitch, the third of my glitch discoveries. This is the third glitch that I've discovered, and it was in the Virtual Console version of Super Mario Bros. 3. Unfortunately I do not really remember how I got myself into this one, but luckily I have a picture (poorly taken, but not doctored nontheless) as proof. 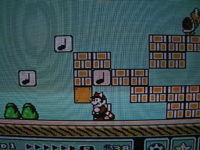 As you can see, I was Raccoon Mario in World 1-1, and somehow I got myself wedged in the block and was shaking violently. Even when I swung my tail and jumped, the block would not break and there was nothing I could do but wait until the time expired. Another minor glitch, but finding them is the most fun part :D If you have any other information about it, feel free to drop a line on the Classic Nintendo Wiki. Quotes about me, mostly negative positive. To all those who visit this site regularly (who obviously don't have anything better to do) or want to find the latest updates of what Nintendo's doing to bring SMRPG back to life, as of December 8th I will be updating this user page daily. By the way, as of January 12 I started writing for the 'Shroom as an interviewer, and will also be writing the Fake TV section of the Fake News. When Xzelion quit, nobody was writing for interviews or the Fake News, so I had to help out. The Fake News really needs help, not enough people are on the Team, so ask 3Dejong how you can sign up for it. Oh well *sigh* that's all I want to write for now, I guess I'll let you users run off and ruin the Wiki even more that you already have.....after you watch these random YouTube videos, that is! As of February 2009, I'm retiring from this Wiki and most other sites on the web. I can be reached by e-mail (my address can be found on my Classic Nintendo Wiki userpage. Thanks for a great year! This page was last edited on May 21, 2017, at 00:32.